Coppell High School juniors Ananya Pagadala and Anjali Satpathy explain to their group members how to set up a fundraising account. The Build On Club’s purpose is to raise money for underdeveloped countries to build schools. With 10 elementary schools, three middle schools, two high schools, one ninth grade center and one alternative campus, Coppell ISD has not felt the lack of proper education facilities that developing nations face. These countries, ranging from Senegal in Africa to Nepal in South Asia, deal with limited education stemming from their poverty and lack of adequately build schools. Two Coppell High School students want that to change. CHS juniors Ananya Pagadala and Anjali Satpathy have started a club which would help developing nations build schools. The club is a branch of the non-profit organization buildOn, which works to promote education in underdeveloped areas, such as Haiti, in hopes of reducing poverty. Pagadala started thinking about how to make a difference regarding education in her freshman year. While the club itself had not formed in her mind yet, the intent was there. During her and Satpathy’s sophomore year, they began actually considering the formation of a club. After researching various organizations such as Pencils of Promise and Build Africa, the pair decided their best option is to work with buildOn because it has a more specific goal. Pagadala and Satpathy met with a representative of the organization, gained the sponsorship of CHS AP environmental science teacher Rebecca Wheatley and began working on their club. Now that the club is up and running, they are beginning to draw in members. The club now has 23 members, a number which is expected to grow. The goal is to raise money through a series of fundraisers, including T-shirt sales and bake sales. All money will be donated directly through the organization. Each member is given the goal of raising at least $2,000. This is the minimum for individuals to qualify for “the trek”, which is the opportunity for said individual to travel to the designated country where the money will be sent. There, they will be exposed firsthand to the conditions they are helping to improve and will be able to aid in building the school they raised money for. As the club is just beginning, a specific country has not been decided yet. 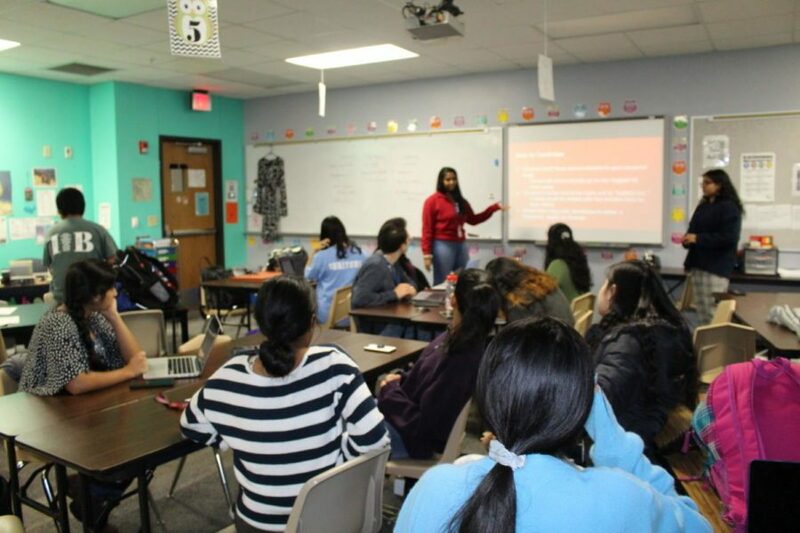 Coppell High School Junior Anjali Satpathy discusses with teacher sponsor, CHS AP environmental science teacher Rebecca Wheatley on how to run the club meeting. The Build On Club was started to raise money for underdeveloped countries to build schools. Some of the challenges the girls expect to face include the large task of spreading the word about the need for promoting education. Another challenge is how CHS students often participate in clubs only to boost their resume, which could damage the appearance of the club and taint its legitimacy. The two girls have put in work towards their goal to make a change. Not only have they worked on this project for two years in planning and preparation, they continue to dedicate their time to the working project. Every Sunday, they dedicate two hours specifically for working on their club. Currently, the club meets every other Friday at 8:10 a.m. in room E208. It is open for all to join. This story was originally published on Coppell Student Media on January 25, 2019.